Using technology for social good, and not just increasing profits, has become a running theme over the past twelve months. The emphasis has been on demonstrating, sometimes quite forcefully, that technology in general and AI in particular, really can be used to enhance our lives. This time last year Michael Dell made a cogent explanation for why there is more to be gained from AI than ought to be feared. Then, earlier this year Microsoft highlighted how AI is being used to address the threats our endangered wildlife are facing, and then how biotech companies are leveraging technology in the battle against cancer and genetic diseases. At the end of last week Microsoft rounded off the year by holding a hackathon at its offices in Bryanston that demonstrated more than noble inspirations, but rather tangible actions. To this end it brought together ten teams, competing to create the winning application of AI for social good. From solutions that addressed curbing the spread of diseases, to one that dealt with identifying fake news, each of the innovations on display in their own way aimed at addressing weighty concerns. Well, solving the world’s problems with AI would take years, right? Wrong. Some of the solutions were in fact developed over the course of a weekend, whereas others were in development for weeks or a couple of months. “We extended an invite to our customers, partners, and communities to submit a proposal of an AI solution which the they believed would make a definite difference to South Africans. We purposefully refrained from defining ‘Social Good’ as we wanted the teams to show us their view of what matters most through their creations,” elaborated Asif Valley, National Technology Officer at Microsoft South Africa. While the three to five person teams were able to use any operating systems, development language, development framework, development tools or hardware to bring their AI app idea to life, there were some guidelines. Firstly, they had to utilise Microsoft Azure Machine Learning or Microsoft Azure Cognitive Services as part of the solution. Secondly, they had to be able to deliver a working prototype of their idea by the end of the two-day event. Finally, their idea needed to address the needs of individuals or communities; small businesses or large corporations or public enterprise, urban or rural areas, people or animals, be either future focused or capture the past. Each team then had to create a presentation that demonstrated their thinking and do a live demonstration of their prototype, while conveying their message in seven minutes. The prototypes were judged based on the following criteria: Vision and Clarity; Creativity and Innovation; and Potential Real-World Impact. The projects spanned a variety of approaches. For example, a few of the solutions including a missing pet app by PawDitect; a crime prevention app by RoadSnitch; another that helps doctors examine X-rays without the help of a radiographer by Rad.AI; and an app that turns text into speech for the deaf community, so they’re able to communicate with those who don’t speak sign language, by Sign.I.ficant. However, it was the team Azure Gremlins which won the hackathon (and a trophy), for their AI app that identifies fake news sites, followed closely behind by Sign.I.ficant for their sign language interpretation app. The fake news detection app works off content merit, analysing certain features of text, rather than by the origin of the fake news itself. 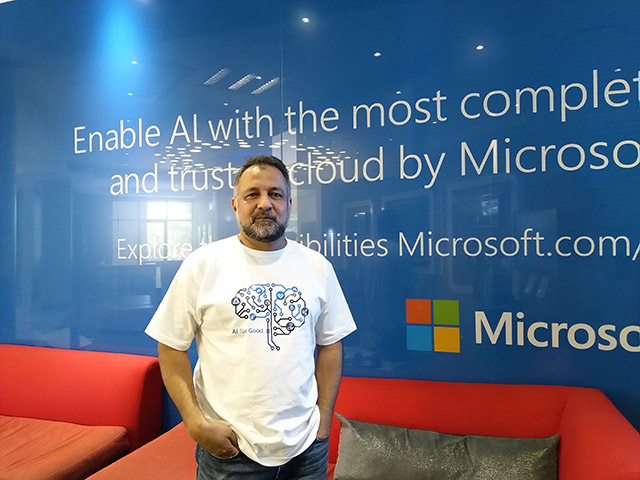 “We hosted AI Hack for Social Good to facilitate the creation of innovative prototypes that leverage the AI and Machine Learning Services in the Azure Cloud. It’s a great opportunity for anyone - both veterans and newcomers to the Azure Cloud - to showcase their talents and build something innovative. We certainly achieved that today and are blown away by the local talent that exists in South Africa, which we hope to act as a stepping stone for, and give the encouragement it needs to grow,” enthused Valley. He concluded by reassuring that there would be other hackathons of this type in the future.